Semi-untethered jailbreaks like H3lix, Yalu102, Phœnix, and LiberIOS put an app icon on the Home screen so you can boot into a jailbroken state after your device restarts, but that’s really the only time you’ll ever use these apps. Whenever you’re in a jailbroken state already, these apps seem pointless to have on the Home screen. That said, a new free jailbreak tweak called Hid3x by iOS developer ipad_kid can hide these apps whenever you’re in a jailbroken state, as shown above. 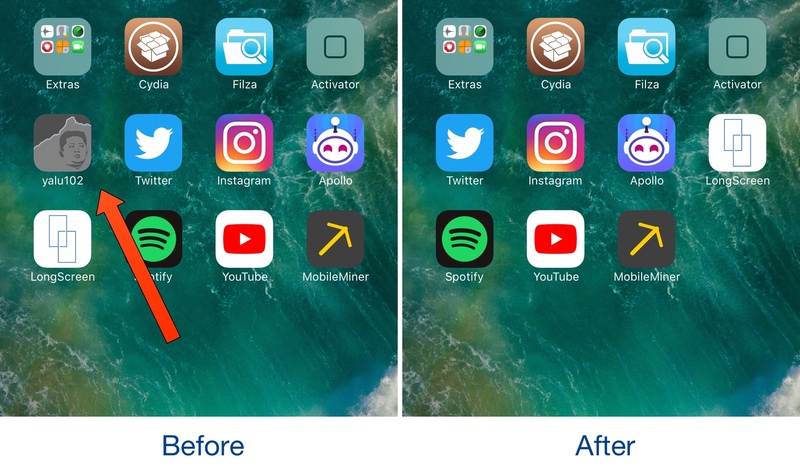 The tweak essentially prevents these apps from appearing on your Home screen indefinitely, but it only works when you’re in a jailbroken state because it depends on Cydia Substrate. As soon as you reboot your device into a non-jailbroken state, Cydia Substrate stops functioning and so does Hid3x. In this event, the icon conveniently reappears, letting you boot back into a jailbroken state without any fuss. In short, Hid3x won’t prevent you from getting back into a jailbroken state if you needed to, so installing it is entirely safe. Minimalists and neat-freaks that keep their Home screen looking spiffy at all times should enjoy Hid3x because it hides unwanted clutter when it isn’t needed. Furthermore, it’s a cleaner way to deal with the situation than merely tucking the app away in a folder. Then again, not everyone has the desire to hide these apps away, so it really comes down to personal preference and how you use your device. If you’d like to give Hid3x a try, then you can download it for free from Cydia’s BigBoss repository. The tweak doesn’t come with any options to configure, and it works on all versions of iOS with a semi-untethered jailbreak. Do you like seeing your semi-untethered jailbreak app on your Home screen at all times or do you enjoy having it hidden when it isn’t needed? Let us know in the comments section below.